QED's flagship Aircore technology cable, availble per metre. Simply adjust the quantity you require. Silver-plated oxygen-free copper tubular conductor geometry. For use in the finest hi-fi and home theatre systems, this design delivers a massive cross-sectional area using X-TubeTM technology to eliminate the skin effect whilst maintaining a user friendly “figure of 8” geometry. Simply add the quantity you require to your basket - price is per metre. 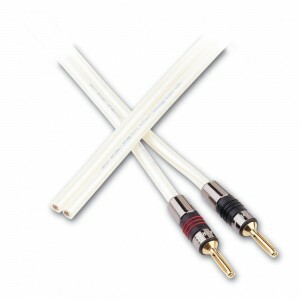 We can also terminate your cable using banana plugs and heatshrink, for only £29.99 per order. With termination, we will cut the total number of metres ordered in half and terminate a stereo pair (for example, if you order 8 metres, we will terminate two 4 metre lengths).